“White House Down”: Four score and twenty bullets ago . . . It was right about the time Channing Tatum was doing donuts in the presidential limo on the south lawn of the White House, tearing up turf as the bad guys chasing him fired from roof-mounted machine guns, that I suspected “White House Down” would not be a nuanced film about geopolitics. Actually, that’s not quite true. Right about the moment I saw the words “A Roland Emmerich Film” during the opening credits, I knew I was in for something ridiculous. This is a director, after all, who has assaulted the world with aliens, Godzilla, flash-freeze global warming, and a Mayan calendar that as it turns out was not all that accurate. And the thing you have to shake your head and kinda admire about a Roland Emmerich film is that he creates such goofy CGI mayhem so humorlessly, as if the world desperately needs to see itself flattened and fricaseed again and again. Except for “White House Down.” Though assuredly as nutballs as its predecessors in the Emmerich oeuvre, this is a really fun action movie, and acutely aware it’s a really fun action movie. 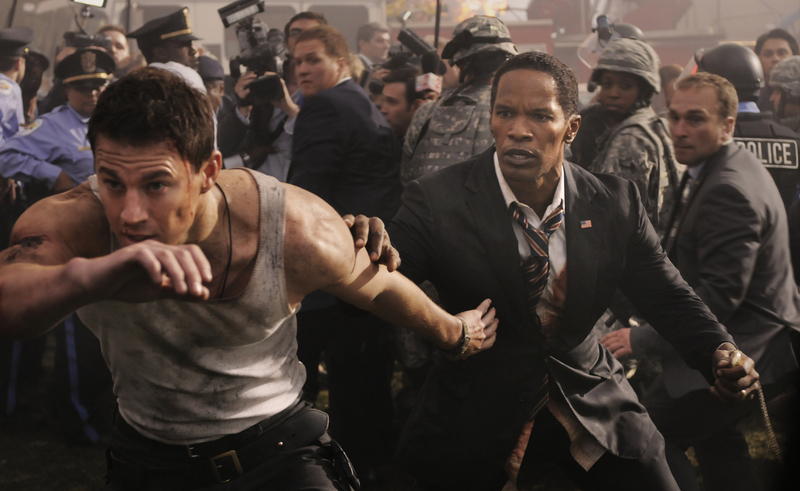 Unlike the sober R-rated “Olympus Has Fallen” of just a few months ago, “White House” down is fleet-footed and enjoyable, finding room for plenty of laughs within the mayhem. While “This Is The End” fans know this could only be the second-best Channing Tatum film of the summer, he exudes movie-star aw-shucks charisma as John Cale, a Capitol Security agent protecting the Speaker of the House (Richard Jenkins). Cale wants to move up to the White House, mostly to impress his disaffected 11-year-old daughter Emily (Joey King), who is a freak for presidential trivia. (I mean, what 11-year-old girl isn’t, am I right, parents?) He takes her a long on his job interview at 1600 Pennsylvania Avenue, and while they’re there, all CGI hell breaks loose. Mercenaries led by the glowering Jason Clarke of “Zero Dark Thirty” take over the White House in a manner that’s just plausible enough to be unsettling, their sights on President James Sawyer (Jamie Foxx). Apparently Sawyer’s plan for a major peace treaty that involves pulling all U.S. troops out of the Middle East doesn’t sit well with defense contractors. But Cale rescues the president, and the pair sneak around the White House, from the residence on the top floor to the catacombs where JFK allegedly smuggled in Marilyn, trying to stop the bad guys and save the day. Yes, it’s “Die Hard in the West Wing,” and “White House Down” isn’t shy about driving the comparison home, having Tatum storm the halls in a very McClane-esque white wife-beater, and making one villain, a fey hacker, awfully fond of Beethoven (but Beethoven’s Fifth, not “Ode to Joy.”) Truth be told, “White House” could teach a few lessons to the sputtering “Die Hard” franchise. Emmerich and screenwriter James Vanderbilt effectively use the enclosed spaces of the building to create tense, well-staged action sequences, and effectively crosscut with plucky young Emily’s attempts to send info about the mercs to the outside world, as well as lots of frowny-faced officials in various control rooms. Michael Murphy, who recently charmed audiences at the Wisconsin Film Festival, even gets to play the Veep, although he spends most of the movie on Air Force Two and may be up for Best Performance by a Supporting Actor on Skype. But what makes the movie click is the connection between Tatum and Foxx, who both sell the audience on the stakes involved while still being a very funny team. The movie loses a little of its zip about two-thirds of the way through, when plot requirements force Cale and Sawyer to split up, and Emmerich starts getting more concerned with large-scale destruction and a “fate of the free world is at stake” escalation in the plot. Although, it may be considered a newfound sign of maturity in Emmerich that only the free part of the world risks annihilation this time around, and not the whole enchilada. Bunch of fun, whichever way you look at it. It’s dumb, but that’s all you need for some summer entertainment. Good review.